The Missouri House has passed the 13 bills that make up the Fiscal Year 2016 state budget about three weeks earlier than usual. Republicans want to send the budget to Gov. 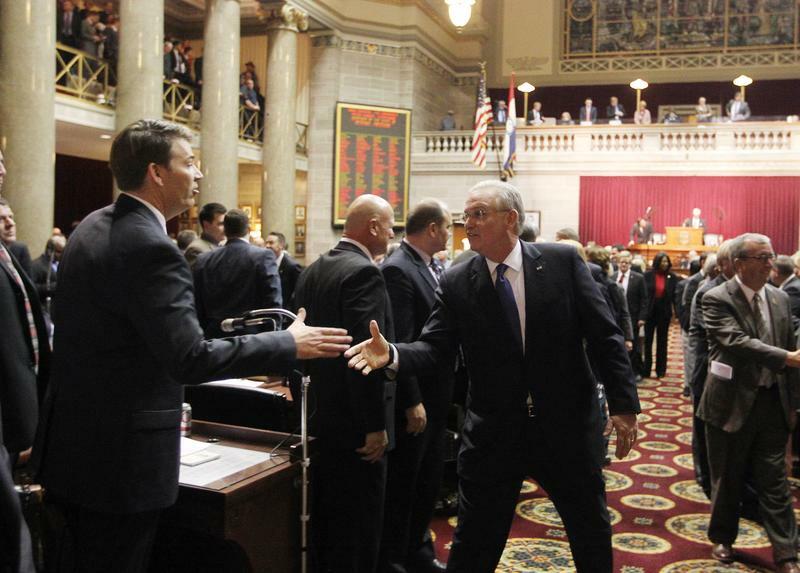 Jay Nixon, a Democrat, early enough to require him to make any line-item vetoes while lawmakers are still in session. That, in turn, would allow them to override any vetoes right away instead of waiting until September's veto session. "We (would) have enough time to work out any disagreements we may have with the governor while we're still here in session, and not allow a whole summer of discontent and uncertainty for the various agencies that are funded in our budget," Speaker John Diehl, R-Town and Country, told reporters after the House adjourned for the week. It would also potentially prevent Nixon from spending the summer traveling around the state and whipping up support for any vetoes he would make within the budget. The tactic worked to his advantage in 2013 when lawmakers failed to override his veto of a controversial tax cut. Last year, lawmakers passed a similar tax cut early enough to stage a successful veto override before the end of the 2014 legislative session. Thursday's debate was also dominated by the Republican majority's refusal to expand Medicaid. State Rep. Margo McNeil, D-Hazelwood, accused GOP leaders of shortchanging Missouri's infrastructure, schools and health services by not expanding Medicaid. "It's no surprise that Missouri is not moving forward with economic development like some of our surrounding states," McNeil said. "We have depressed our economic development through our decisions in this body." State Rep. Scott Fitzpatrick, R-Shell Knob, argued that Missouri wouldn't be guaranteed its share of federal dollars if Medicaid were expanded. "Let's not forget that the federal government is running and operating (at) a deficit, so this is not necessarily tax dollars," Fitzpatrick said. "A lot of this is money that we're borrowing, whether we're issuing treasury notes and it doesn't matter who's buying it, if it's China or anybody else, it's still debt, (and) it's still devaluing the American dollar when we issue more debt and we have to print money to essentially pay for it." The budget also does not include a pay raise for state workers. Last year, lawmakers approved a 1 percent pay raise, but Nixon withheld funding for it, saying it was necessary because Republicans had passed a budget that was "seriously out of balance." Nixon announced on Christmas Eve that he would be releasing the funds, which allowed the one percent raises to take effect Jan. 1. The 13 bills that make up Missouri's Fiscal Year 2016 state budget have received first-round approval from the Missouri House. The roughly $26 billion spending plan, which takes effect July 1, would increase funding for Missouri's K-12 schools by $74 million, but that still falls far short of fully funding the state's foundation formula. That would require a spending hike of $482 million this fiscal year. The Parents as Teachers program was originally slated to receive a $3.5 million funding boost from House budget writers, but an amendment was approved Tuesday to reduce that increase to $2.5 million and shift that extra million to another program, Teach for America. The program recruits and trains professionals from other fields to spend two years teaching in poor communities. Floor Leader Todd Richardson, R-Poplar Bluff, says Teach for America's Missouri program currently has a zero balance. "We have to make decisions about how we're going to prioritize what we're spending," Richardson said. "I think we can afford to spend a million dollars on something else that's worthwhile." Several Democrats opposed the move, saying Teach for America does not have a proven track record. "Our children that need the most, the best, the talented, the most experienced (teachers) to work with these children, they're getting brand new people out of college that have no training whatsoever," said state Rep. Genise Montecillo, D-South County. "How many of you would want those teachers for your children?" Richardson disagreed, telling the chamber that he personally witnessed Teach for America teachers in classrooms in St. Louis. "I called my wife and I said, 'I've just been to an open-access public school in the city of St. Louis that I would be proud to send my children to,'" Richardson said. Meanwhile, state Rep. Margo McNeil, D-Hazelwood, decried the decision to fund Teach for America by reducing money for Parents as Teachers. "I can think of nothing more harmful to the education system of this state than cutting back these much-needed funds," McNeil said. "Several years ago, we had a much-higher dollar amount going to Parents as Teachers, (and) we made it available to any parent, free of charge, in the state. Now we're down to only those parents who(se children) qualify for free and reduced lunch." Parents as Teachers provides at-home training and assistance to poor parents to help them develop their parenting skills so they can effectively prepare their children to begin school. It was created by a 1984 law signed by Kit Bond, a Republican, during his second term as Missouri governor. The House's perfected version of the higher education bill contains $9 million more than the governor's initial budget recommendation. State Rep. Jon Carpenter, D-Gladstone, says, though, that the spending hike still isn't enough to fund Missouri's state universities and community colleges adequately. "We fund higher education in this state nearly $300 million inflation-adjusted dollars less than we did at the turn of the century 15 years ago," Carpenter said. He suggested that sufficient funding for higher education and other needs could be met by passing legislation to raise Missouri's tax on cigarettes to 62 cents per pack. That bill has gone nowhere so far; in the event that it were to actually be taken up and passed, it would also require approval from Missouri voters. The Higher Education Department budget for next year contains more than $1.2 billion, $922 million of which is made up of state funds, $3.6 million from the federal government, and nearly $342 million from other funds. As expected, yet another attempt was made to expand Medicaid, but everyone in the House chamber knew it would fail. The amendment, sponsored by stae Rep. Judy Morgan, D-Kansas City, would have increased Medicaid eligibility to Missouri residents earning up to 138 percent of the federal poverty level. Morgan said that would roughly translate to an annual salary of $16,000 a year for an individual or $32,000 a year for a family of four. Currently, a working parent who's not elderly can earn only up to 19 percent of the federal poverty level to be eligible for Medicaid in Missouri. McNeil argued that GOP leaders are committing "legislative malpractice" by not expanding Medicaid. "We have already turned away $4 billion," McNeil said. "Our taxpayer dollars went to Washington (and) stayed in Washington, rather than come here and help provide health care for our citizens." State Rep. Caleb Rowden, R-Columbia, argued that the current Medicaid system is already eating up revenue that could be used for other needs, like K-through-12 schools and higher education. "The existing (Medicaid) population, roughly in Missouri, (is) close to 900,000, (and) the expansion population (would be) somewhere (around) 300,000 to 325,000," Rowden said. "(For) the (Medicaid) expansion population, (Missouri would be) on the hook for 10 percent...on the existing population we're on the hook for 40 percent, and we have been for quite some time." The vote to expand Medicaid was defeated on a pure party line vote of 115-44. Morgan's Medicaid expansion proposal wasn't her only one of the day. She also sponsored an amendment that would have de-funded the $12 million annual bond payment the state makes to the Edward Jones Dome, the current home of the St. Louis Rams. It would have redirected that money to K-12 schools. 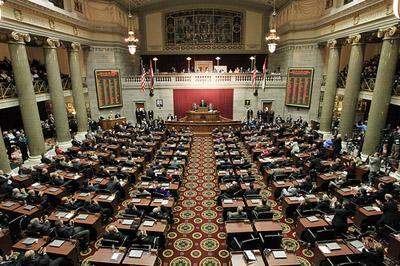 State Rep. Scott Fitzpatrick, R-Shell Knob, argued that the amendment would have "destroyed" Missouri's credit rating. "While we all have varying ideas about whether or not it's appropriate for the state of Missouri to help support public stadiums, (but) this is a commitment the state made a long time ago to service this debt," Fitzpatrick said. Morgan's amendment failed overwhelmingly, 135-18. The House also rejected an amendment that would have barred the use of state-owned aircraft from being used to hunt feral hogs. House bills 1-13 are scheduled for a third-read vote Thursday, which will send them to the Missouri Senate. Lawmakers have until May 8 to send the FY2016 state budget to Gov. Jay Nixon. A former basketball player himself, Missouri Gov. Jay Nixon used the sport Wednesday to illustrate ways that the state can advance racial healing as it seeks to get beyond the months of protests prompted by last summer’s police shooting in Ferguson. In Wednesday’s State of the State address, the governor recounted how Highway Patrol officers assigned to keep order pooled some of their own money to pay for a basketball net and new basketball. That generosity, Nixon said, later led to a pickup basketball game. After months of lower-than-hoped-for revenue collections, Missouri's state government saw an unexpected boost in income in December. And that could result in lower tensions over money in the Capitol. 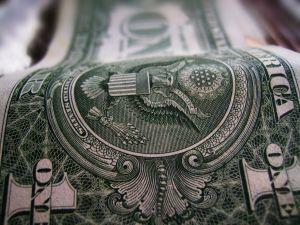 State income – primarily taxes – rose 10.7 percent in December, compared to the same period a year ago. The chief reason: higher collections in individual income taxes and sales taxes.